Aquaporin viewed from outside the membrane. Cell membranes are fairly waterproof, forming a barrier that resists the crossing of water molecules. Some cells, however, need to allow more water to flow through the membrane. For instance, the concentration of wastes in the kidneys and the internal pressure of the eye involve careful control of water. In these cases, cells use aquaporins to control the flow of water in and out of the cell. Aquaporins are found in many types of organisms, from bacteria to humans, and they all have a characteristic structure. They are composed of four identical chains, each with its own channel at the center of the subunit. As described below, this channel is filled with a single-file queue of water molecules passing through the protein. The larger hole formed at the center of the four chains is lined with carbon-rich amino acids, and presumably is plugged by membrane lipids in the cell. The aquaporin shown here, from PDB entry 1fqy , is found in red blood cells. 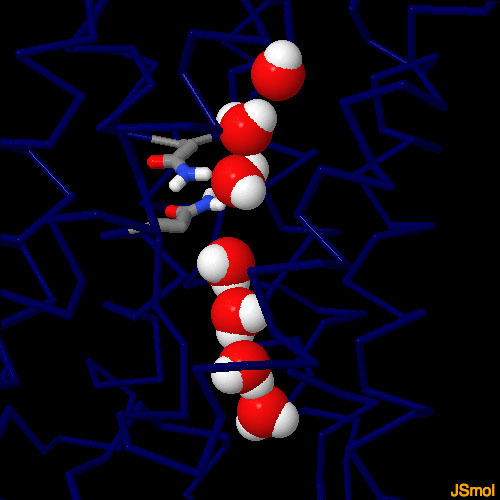 A recent very high resolution structure, in PDB entry 3zoj (not shown), revealed that two charged amino acids at the entry to the water channel are important to ensure that only water, and not hydronium or hydroxyl ions, pass through the channel. Since aquaporins play an essential role in regulating osmosis in many cell types, scientists are currently looking for ways to block their action, to create ways to treat water-related diseases such as glaucoma. Aquaporins were originally discovered by the observation that mercury blocks water flow in and out of red blood cells, but unfortunately mercury is far too toxic to be used as a drug. Currently, scientists are looking for new inhibitors to block particular types of aquaporins, for use as drugs. Cross-section through a subunit of aquaporin using a solvent-accessible surface to show the water channel. The membrane is shown schematically in blue. We make over a dozen different types of aquaporins, for different uses in different types of cells. Some are highly specific for water, while others can also pass other molecules. 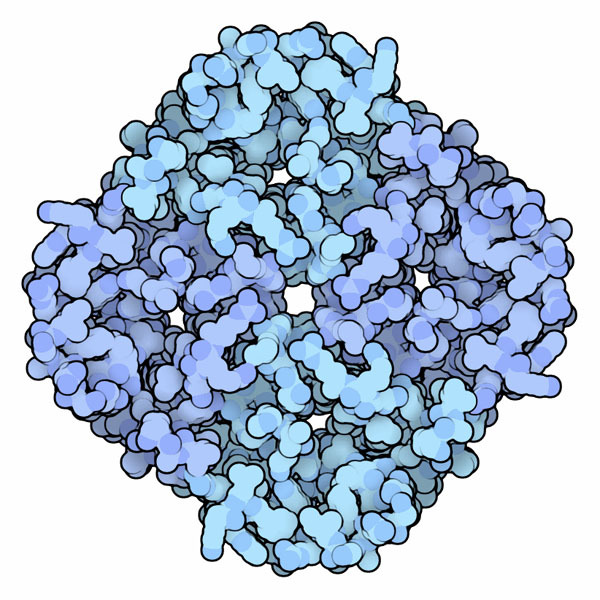 The one shown here is a bacterial aquaglyceroporin, PDB entry 1fx8 , that can pass both water and glycerin. One subunit of the protein is shown here, clipped to show the tunnel that passes through the membrane. Notice that there is a constriction near the top of the channel; this controls the types of molecules that can pass through. 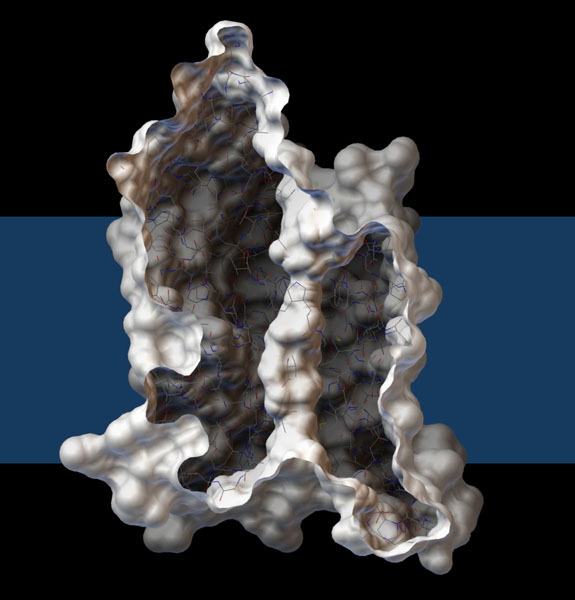 This image was created with the Python Molecular Viewer. The water channel through aquaporin could cause a serious problem: strings of water are normally able to transfer protons quickly from molecule to molecule by the "Grotthuss mechanism." This would be a disaster, since it would quickly deplete the electrochemical gradient that powers many of the pumps at the cell surface. Aquaporin prevents this by forcing the water molecules to sit in a specific orientation that won't work as a proton wire. There are two characteristic asparagine amino acids that hold a central water molecule (or two water molecules in PDB entry 3zoj ) in a specific orientation. This water, along with other amino acids lining the channel, then interacts with the flanking waters in the queue, forcing the ones at the top to point one direction, and the ones at the bottom to point the opposite direction. Click on the image to view an interactive JSmol that shows the waters and the aquaporin amino acids that orient them. This image was created with PDB entry 1ymg , and the hydrogen atoms, which are not seen in the crystallographic structure, were added manually. Structures of several different types of aquaporins are available in the PDB--you can use the "Compare Structures" tool to explore their similarities. Many of the structures of aquaporin are closed, with amino acids moved to block the water channel. Scientists are still studying whether this is part of an active gating process. T. Gonen & T. Walz (2006) The structure of aquaporins. Quarterly Reviews of Biophysics 39, 361-396.